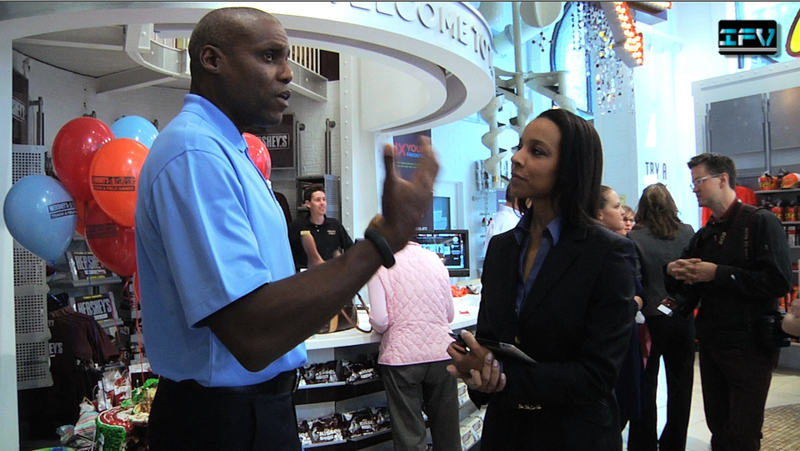 Log onto http://www.ifvnews.com, starting Monday, March 12th to watch Carl Lewis' featured interview with IFV News. ...I tell athletes, "Keep your weight down and do not retire with a lot of debt. IFV News Finds Out How Olympic Champion Carl Lewis Planned His Life as an Entrepreneur Way Ahead of the Game. He shares his message, which includes the importance of branding, re-branding and planning. Olympic great Carl Lewis laid out his life plan as an entrepreneur well before hanging up his champion track shoes. Lewis created a life-long strategy and through entrepreneurship became involved with businesses, associations and entertainment. His branding/marketing company -- Carl Lewis Entertainment Group -- along with FitForever.com By Carl Lewis has helped him secure longstanding relationships with companies like Hershey. IFV News host Marcella Palmer speaks with Lewis from the Hershey’s Track & Field Games' 35th birthday celebration at the Hershey's Chocolate World Times Square Store in New York City. For nearly two decades Lewis has been involved with Hershey’s Track and Field Games. IFV News also speaks with Jeff Beckman, Director of Corporate Communications at The Hershey Company, who shares how entrepreneurs are a valuable resource for the games at the community level. Carl Lewis is one of only two Olympic athletes to win nine gold medals and one of only two to win the same individual event four times. This track and field champion won 10 Olympic medals and nine World Outdoor Championship medals during his career. His accomplishments have led to numerous accolades, including being voted "Sportsman of the Century" by the International Olympic Committee and being named "Olympian of the Century" by Sports Illustrated. Since his retirement from active competition in 1997, Carl Lewis has devoted a great deal of his time and energy to charity, founding “The Carl Lewis Foundation,” which serves as an umbrella for the many charities that Lewis supports including many youth fitness groups. Founded in 1977 by Dr. Donald P. Cohen in Charleston, W.Va., Hershey’s Track & Field Games has grown from a local playground event in a single community to an international program encouraging children and family activity to help them lead healthier, balanced lives. More than 10 million children from the United States and Canada have participated in the Hershey’s Track & Field Games to date. Hershey’s Track & Field Games is the largest youth sports program of its kind with thousands of children participating in the program yearly, representing over 4,000 communities. The Hershey Company is the largest producer of quality chocolate in North America and a global leader in chocolate and sugar confectionery. Headquartered in Hershey, Pa., The Hershey Company has operations throughout the world and approximately 12,000 employees. With revenues of nearly $6 billion, Hershey offers confectionery products under more than 25 brand names, including such iconic brands as Hershey's, Reese's, Hershey's Kisses, Hershey's Bliss, Hershey's Special Dark, Kit Kat, Twizzlers, Jolly Rancher and Ice Breakers. Hershey also offers premium and artisan chocolate products under such brands as Scharffen Berger and Dagoba through the Artisan Confections Company, a wholly owned subsidiary. For more than 100 years, The Hershey Company has been a leader in making a positive difference in the communities where its employees live, work and do business. Corporate Social Responsibility is an integral part of the company’s global business strategy, which includes goals and priorities focused on fair and ethical business dealings, environmental stewardship, fostering a desirable workplace for employees, and positively impacting society and local communities. Milton Hershey School, established in 1909 by the company's founder and administered by Hershey Trust Company, provides a quality education, housing, and medical care at no cost to children in social and financial need.